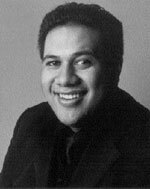 Jonathan Lemalu, a New Zealand born Samoan, is already at the forefront of today’s young generation of singers. He studies in London with Vera Rosza. In 2002 he graduated from a Postgraduate Diploma Course in Advanced Performance on the London Royal Schools Opera Course at the Royal College of Music and was awarded the prestigious Tagore Gold Medal. He is a joint winner of the 2002 Kathleen Ferrier award and the recipient of the 2002 Royal Philharmonic Society’s Award for Young Artist of the Year. Already in great demand in opera and on the concert platform he has performed at the Tanglewood and Ravinia festivals; at the Edinburgh Festival he has appeared in Les Troyens under Runnicles, Maria Stuarda and Jeptha under Mackerras. He has made his debuts with the English National Opera as Don Basilio (The Barber of Seville), Opera Australia as Leporello (Don Giovanni) and the Bayerische Staatsoper as the Ghost of Samuel (Saul). Equally at home on the recital platform he has also given recitals at the Munich Festival, the Edinburgh Festival and at London’s Wigmore Hall. He has recital tours throughout Europe and North America, which take him to Cologne, Athens, Birmingham, Amsterdam, Brussels, Baden-Baden, Vienna, Vancouver, Atlanta, Washington and New York’s Carnegie Hall.